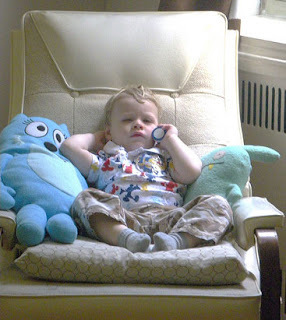 In the picture included with this post, young Master B is listening to his beloved songs from Yo Gabba Gabba, his favorite television show. I would prefer that he took a nap, but I suppose having quiet time with a few stuffed friends is okay too. Parental Unit #2: Bertram, do you like cereal? Parental Unit #2 swears that he did nothing to encourage this. Bertram is drawn to the sounds of computer beeps and car honks. Oh, the fun we have here.